62/365(+1), a photo by Luca Rossini on Flickr. Our moving to the next house is approaching, and hence our visits to places such as IKEA and Le Roy Merlin are getting more frequent, take longer time, and cost some real money. I don’t generally like spending my time shopping, even less when I have to do it in huge, congested, nosy, evenly illuminated (I’m always looking for shots, remember? ), and closed environments such as mega stores. But shopping at IKEA is something different, something I dislike more from some unconscious level. I’m not bored, stuff around is nicely sorted and there is always some enjoyable novelty in furnitures. It doesn’t actually feel congested till you reach the counters, only then you realize how many people were walking around with you. It’s less noisy than normal mega-stores. And lights are even interesting. So, why is that? Why do I feel like a mouse in some experimental maze while all I’m doing is looking for a table set for our new living room? When I came back from the store, I looked for some answers on the web, and there I found this great YouTube video of Prof. Alan Penn, from University College of London, on how IKEA stores are architecturally organized to produce exactly this kind of mouse-in-the-maze feeling. From his talk I firstly understand that while almost everyone who has access to an IKEA store uses it frequently, just a very small minority enjoys the experience. Prof. Penn has a numerous set of softwares to help him analyze markets’ architectural efficiency. He also has a deep understanding of what makes an enjoyable shopping experience. I won’t get into the details, let’s just say that IKEA does not respond to any of the “enjoyable features”, but is perfectly designed around the “architectural efficiency”. It is actually so perfectly designed that, it may be the only example in the world, where the customers behavior in an IKEA store matches perfectly to the mathematical model. 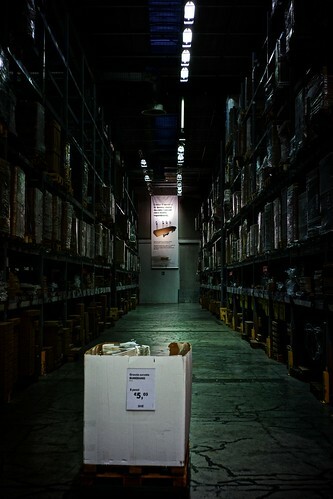 You can feel lost, but IKEA knows exactly where you are, and that is where you are supposed to be: in the actual largest mouse-maze ever built.